We are on the cusp of the "Series 4" Apple Watch, but older models still have a lot to offer. AppleInsider looks back at our daily use of the Series 3 Apple Watch, since day one of availability. Since the beginning, I've been an unabashed fan of the Apple Watch. At the onset, I was originally taken by the novelty of a new Apple product, and to a smaller extent, the attention and questions that came from being seen wearing Apple's new wearable. As that novelty wore off, the Apple Watch needed to do more to warrant its inclusion into daily life. The Series 2 moved slightly in that direction and did a decent job of fixing the slowness that plagued the original. The Series 2 was a bit underwhelming for me in use. It was faster, but I was still constantly bombarded with long load times and a rarely-working Siri. When the Apple Watch Series 3 was announced, I was hesitant about the improvements made. Would they be enough to bring me back on board with the Apple Watch? Here we are, almost exactly 11 months to the day after release, and -- spoiler -- I love it. And watchOS 5 will make it even better. This year, I departed from my usual silver-toned stainless model for the Space Black Stainless variant. I was really interested to see how it would hold up over time. With the silver quickly becoming covered in "micro-abrasions," I wondered if the Space Black would do any better. While it isn't unscathed, to my surprise, it looks markedly better than the silver stainless after the equivalent amount of time. This isn't exclusive to the Series 3, but was my first time experiencing the Space Black color long-term. When the time came for me to pre-order my Apple Watch, I opted for cellular, a new option with the Series 3. I wasn't sure how much I would ever use it, but I assumed at worst I could cancel the monthly service. As it turns out, I've fallen in love with the ever-present LTE connection and use it constantly. I leave my house more often than I realized without my phone taking frequent dog walks, bouts of exercise around the neighborhood, or even a quick trip the store. I feel much better knowing I can still receive calls, texts, and smart home notifications while away. There are still some apps that rely too heavily on the iPhone to function while away, which is a worrying trend that has yet to be corrected by developers. In fact, we've seen some Apple Watch apps disappear completely. The watchOS 5 is even more powerful, so hopefully, we see this trend reverse itself in the future. I may be in the minority, but I use Siri all the time. What frustrated me most with the Apple Watch previously as the serious lag found in Siri. It could take a second to invoke her, then after I asked her a question a few moments passed as it was transcribed, then I would see "I'll tap you when I'm ready" on the screen while she thinks. This frustrating message still appears once in a blue moon on Series 3 but is largely a thing of the past. It is freeing to be able to use Siri on my Apple Watch as reliably as my iPhone, at home or on the go, with or without my phone. Speed isn't just improved with Siri but throughout the OS as a whole. Navigating screens, diving into menus, and loading apps is all much faster than it ever has been in the past. This is of the utmost importance to the usability of the Apple Watch. No one wants to hold their wrist up in the air waiting for something to load. Short and quick interactions on the Apple Watch are key, but before Series 3, that wasn't always the case. Workouts were a bit improved on the Series 3 and watchOS 4. The new watchOS 5 brings even more improvements to this realm, which I've been very much loving during the beta period. Apple Watch has always been a motivating factor for me to get up and move and hit the gym, and Series 3 even got me into the pool a few times to swim laps. I really do love its newfound water resistance, but I wish it went a bit further. I appreciate being able to confidently wear the Apple Watch in the pool, shower, or lake without worrying if it will be ok.
That said, I'm an avid SCUBA diver and I would love to be able to wear this with me on dives. Of course, Apple Watch isn't designed for that and thus stays up on the boat. I'll say it, I don't care about the battery life. As long as the Apple Watch is making it through the day, I'm happy. I even started using the Apple Watch for sleep tracking and charging it during downtime at my desk without an issue. Of course, when I head out for a weekend trip I think how nice it would be to not have to worry about charging my watch during my time away, but a series of portable chargers make this less of a concern. I love the travel case from Sena, Pod from Nomad, and keychain charger from Mofuu for these away-from-home adventures. 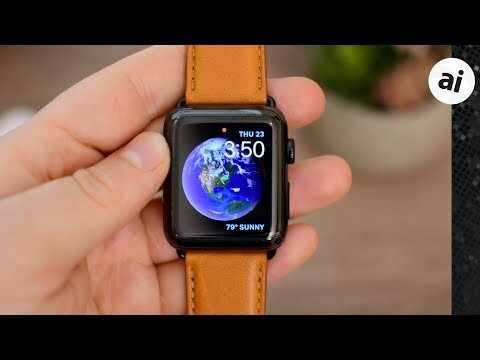 Apple is soon expected to release the Apple Watch Series 4, and it has many wondering what it will have and if they should upgrade. There is really only one thing I can think of that will undoubtedly tempt me towards a new model -- a redesign with a bigger screen. The design of the Apple Watch still looks great, but the bezels are large. They blend in well with the blacks of the OLED display, but it gives a much chunkier appearance than it needs to. After nearly a year, I'm still enchanted with the Series 3 Apple Watch. Water resistance, LTE, Siri, and speed improvements make a huge impact everyday, routine use. Soon, watchOS 5 will be released, which again, makes a dramatic difference in the use of Apple Watch across the board with changes such as improved notifications. I can't say with certainty if I'll be upgrading to the Series 4, but I can positively say that I am still loving my Series 3. Gosh folks, The Apple Watch Series 3 is a wonderful device. I think the Engineers & Developers are amazing. Super awesome. I value this. Keep being awesome, please. I do imagine the future apple series watch will have an led bright light for flashlight mode. I have a Series 2 AW. It’s a great piece of tech tightly integrated into the Apple ecosystem. I use it everyday for several tasks. I'm loving my AWS3. I currently get 3 full days of regular use and 2 days if I have a workout involved. I do look forward to the AWS4 to see what's new. I really struggled to find a Couch to 5K app that didn't need me jogging with a huge iPhone on me. The only one that does it is Intervals. Why on earth the rest, that say they support Apple Watch, actually do it properly and ditch their reliance on the phone. Otherwise, what is the point? I use the existing built-in flashlight all the time! Seriously, all the time. Take the dogs for a walk at night and they go, I've got to pick it up! Can't see, but thanks to my watch I can! Adding the flashlight to Control Center was such a great feature. Plus, they did it so intelligently. They didn't just turn the light on all the way, they use the accelerometer to only turn it on when you tilt it away from yourself. A small thing, perfectly executed. Haha no, I do NOT have it set at 50 active cals! I make a real effort to stay moving! It would have been longer but I was like 5 calories away and the rings were so close I didn't realize I was shy! Soo I killed my original streak! I've been wearing my Apple Watch Series 0 every day since I bought it. Still works great for what I need it to do: time, weather, messages, calendar reminders, controlling music playback from my iPhone to HomePod and Bluetooth speakers, tactile turn prompts with Maps, nightstand clock, fitness tracking, and timers. It's super comfortable and the stainless finish and sapphire glass look as good as new. My only complaint is lack of sleep tracking, which is possible but would throw off my normal usage patterns. Will I replace it with the new Apple Watch 4 if one actually comes out soon? Probably, but not because the AW0 is not serving me well. I'm ready to explore what else I could be doing with my Apple Watch along with a new iPhone. The added water resistance and speed bump will be nice too. I only wish the stainless steel case option did not incur such a steep upgrade cost. What to do with the still very functional AW0? Do you mind sharing where you purchased that orange leather band? They just launched! From Alto! I will actually have a review in the next few days up! What app do you use for sleep tracking? I use Auto Sleep and I really question its accuracy. Oh gosh... I've tried SO many! I really love Pillow. I've used that for a really long time. Lately, I've been trying it without the watch using the SleepScore Max, then they released the SleepScore solo app that doesn't require the physical hardware. Needless to say, I like tracking my sleep and I've tried a bunch of different ones, including Auto Sleep! Pillow for my Apple Watch and SleepScore without are my faves. I also use Autosleep and for me its ok. But You can try sleep ++, it is a free App. I agree and am sad that the Series 0 is being deprecated. Even the battery life on my Series 0 is still a full day - and I've worn mine every day since release. But, if Series 4 moves to a larger screen (in the same form factor), I'll count it as a personal win to have held out this long. Ditto for me. Series Zero ordered the night they came out. Only thing that doesn't work for me is the breathe app. It used to work, but now it might fire up once a week at best. Would love to see a camera added and FaceTime support. I've had the original Apple Watch - and would still have it, if it hadn't fallen, face down, out of a gym locker onto tile floor :-( Then I got the AW2. It's water resistant (so I'm not sure why author thinks that's new for AW3) and a bit faster than the original. Overall very happy. But it seems to have gotten a bit slower waking up when I raise my arm and there's definitely something wrong with the Workout app. When I'm ready to workout, I tap on the app's icon in the lower-right of my modular face - it comes up right away. But when I try to tap the particular workout type I want to start, it would just sit and sit - no reaction; I end up tapping it over and over until it eventually "takes" and goes to the count-down to tart the workout. Really annoyingly frustrating. My wife's 38mm (I have the 42mm) otherwise identical watch doesn't have the issue at all. Turning the watch off and back on seems to alleviate the issue a bit, so I think it's some cruft building up on my watch over time. Initially I thought it was something wrong with the capacitance of the screen - but then other apps would have similar touch issues in that region of the watch face - but I don't see that. Anyway - weird. Can't wait for watchOS 5 - hopefully that'll magically fix things. Nice review guys. Can you please list what band brands you had in the video? Also is that charger with the black cord a 3rd party accessory? Thanks! I’m seriously into LUCID DREAMS research and looking for an app that will detect the last REM cycle and notify me through gentle vibrations on my wrist just before that happens. The idea is to make me conscious without waking me up so I can control the action inside the dream.